Feeling inspired to re-use those distressed furniture you have? We'll show you how! Do you have this distressed chair you’ve been meaning to throw out or repaint? Think again! Achieving a shabby chic interior needs two things – white or neutral toned paint and that distressed dresser or chair that has been lying around in your storage for years! Wouldn’t it be great to actually reuse old furniture at home? 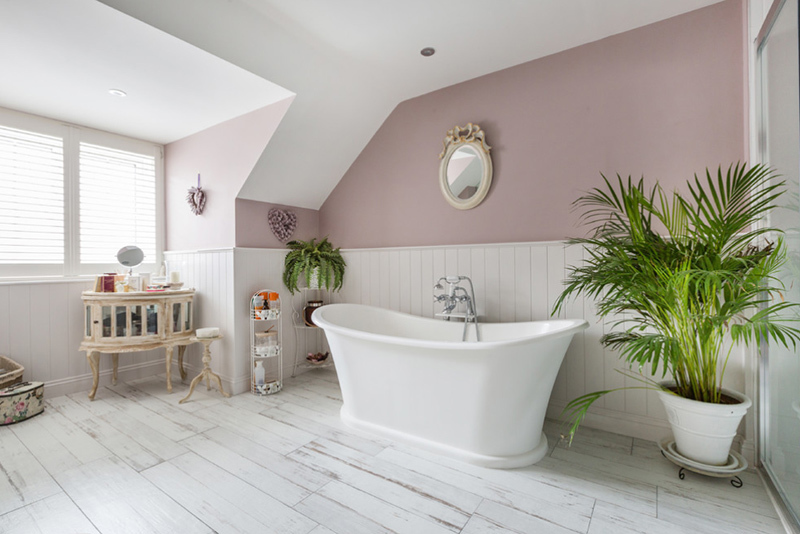 For the most part, homeowners either sell their old furniture or simply keep them away in storage lockers until the time they need to clean up again, but if you are one of those crafty women who like home projects and simply bored one afternoon, redecorating your bathroom could be something that you can do for your house and for your sanity. 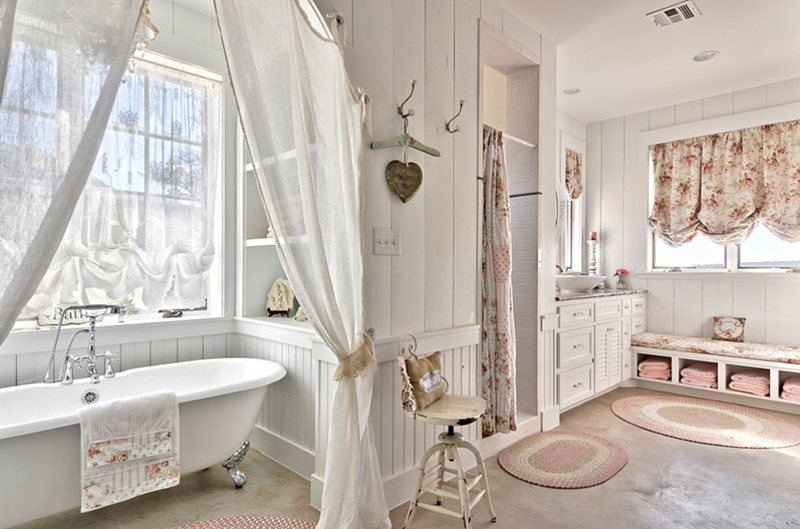 In today’s list, we would be showcasing bathroom designs with a shabby chic theme that are not only pretty but really fascinating. You will even notice that most of the bathrooms here have this distressed chair that just completes the look and believe me, it actually does. 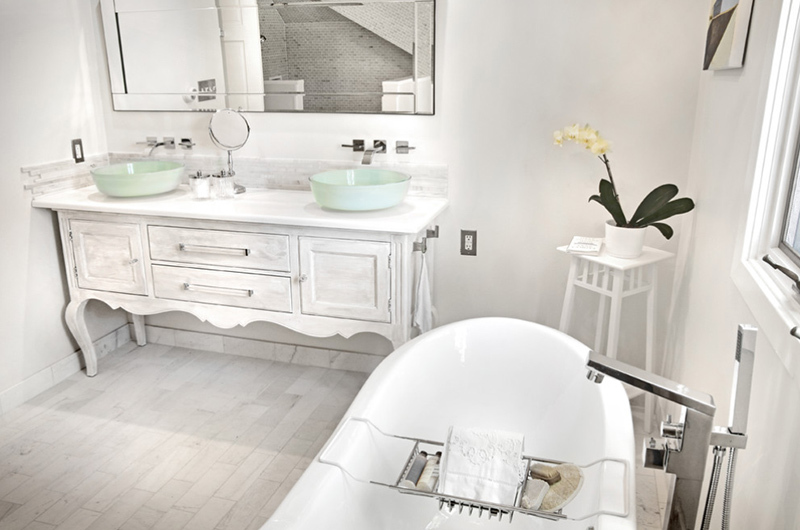 The use of white for shabby chic spaces is one of my favorite perks with this type of design. You can simply use white and basically play with it – go about adding a little more color or add wooden furniture to accentuate the space more. 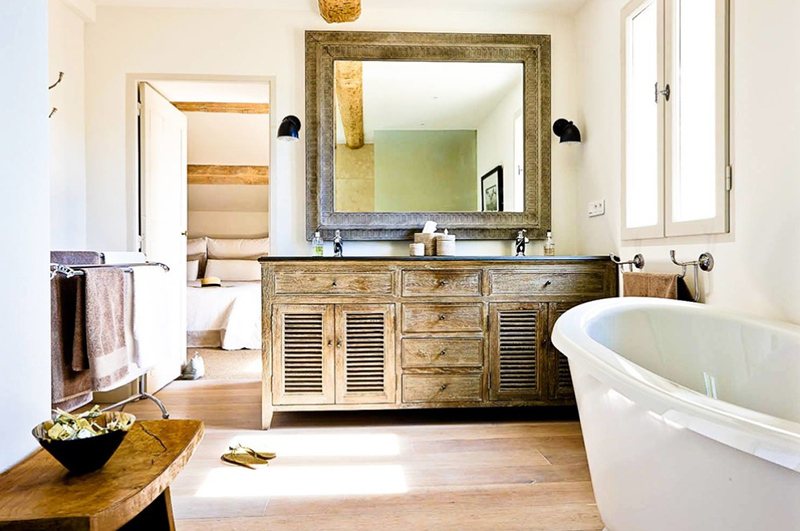 In here, we see a distressed chair just beside the tub, it could serve as seating or as a place to put your towel, robe or phones. Distressed furniture maybe the simplest way to know if one space is a bit shabby or a bit contemporary. Everything around the space is neat and clean and new – adding distressed furniture like a console, gives this look an interesting finish. 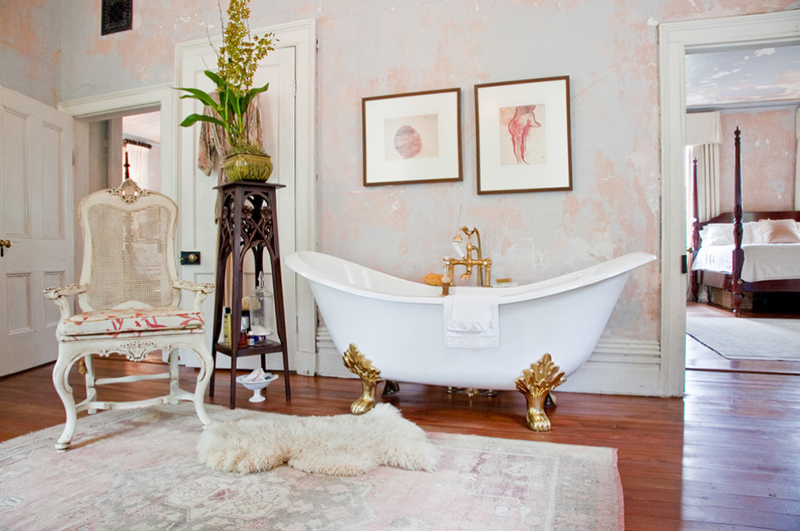 This bathroom sure has enough distressed furniture surrounding the stunning white tub in the room. The pieces of furniture in here sure are fun and have a cool story as to how the owner or the designer acquired them. 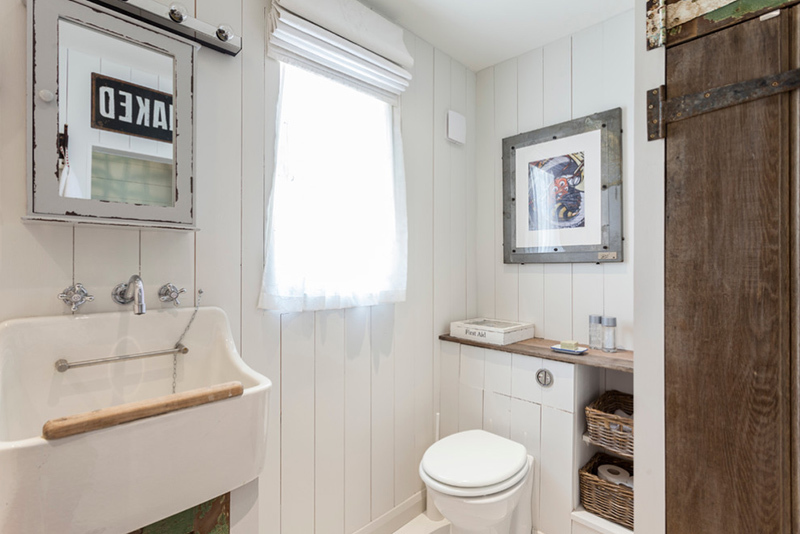 A bit traditional, a bit farmhouse, and a bit shabby – this bathroom from Schmidt Custom Homes sure showcases a feeling of home even inside the bathroom! Pretty interesting! Don’t you agree? We only see a portion of this bathroom, but it sure looks interesting than some bathrooms I have been in. The mirror in this bathroom may be distressed, but I don’t mind taking it home with me! This photo looks like something from a horror movie – it seems to have some story that needs to be shared with other people; like how beautifully designed this space is and how much chills this space is giving us. Pretty picturesque. This sure is one large bathroom! It has its own seating area display case and even a center table! 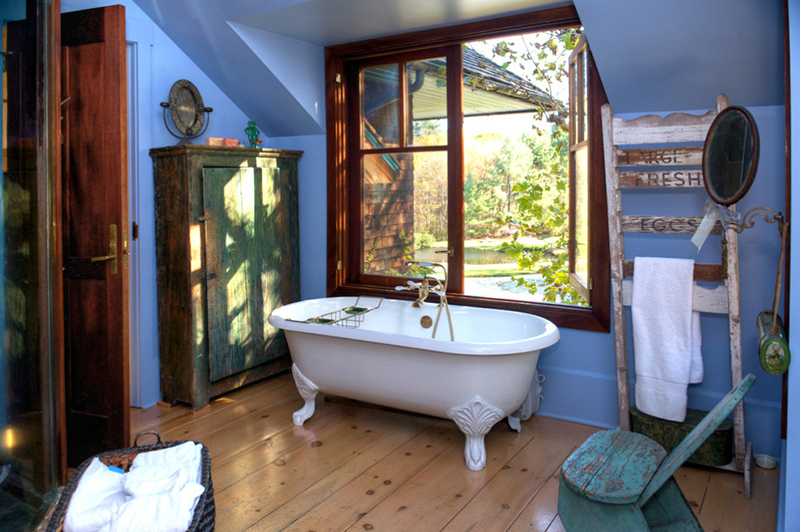 I personally would be shy using this tub because of how open the windows are – but is the entire backyard is yours – then why not? Double vanity sinks are truly special – it makes a bathroom extra wonderful because you and your significant other or whoever you are sharing the bathroom with can use the sink simultaneously while you are actually using it too. Notice the distressed chair by the door? Shabby chic spaces seem to have one of those every so often! Wonderfully distressed cabinet in the middle of the sinks in this bathroom! And do notice that there are two tubs as well – at least the copper one is a tub and the other one across it looks like a Jacuzzi or something. What a bathroom! Everything inside this bathroom looks new except the table where the double vanity is and the mirror just above it. 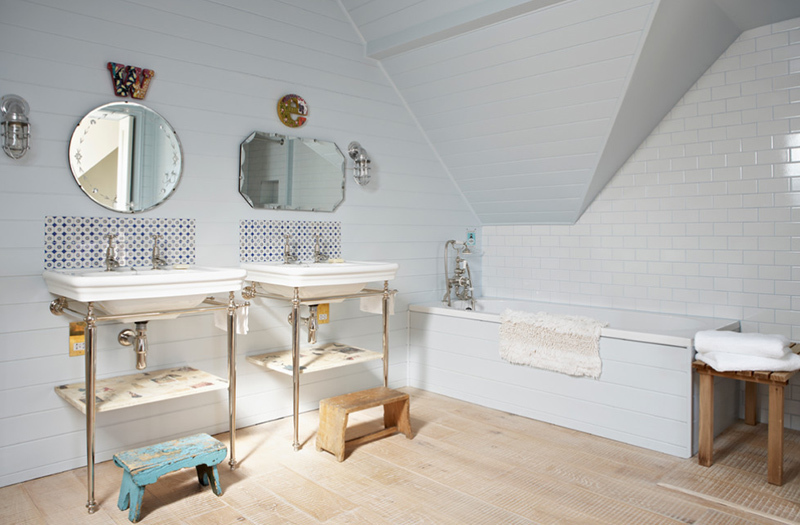 Combining new fixtures and distressed pieces add interest and fun to bathrooms or spaces like this one – a shabby chic inspired space. 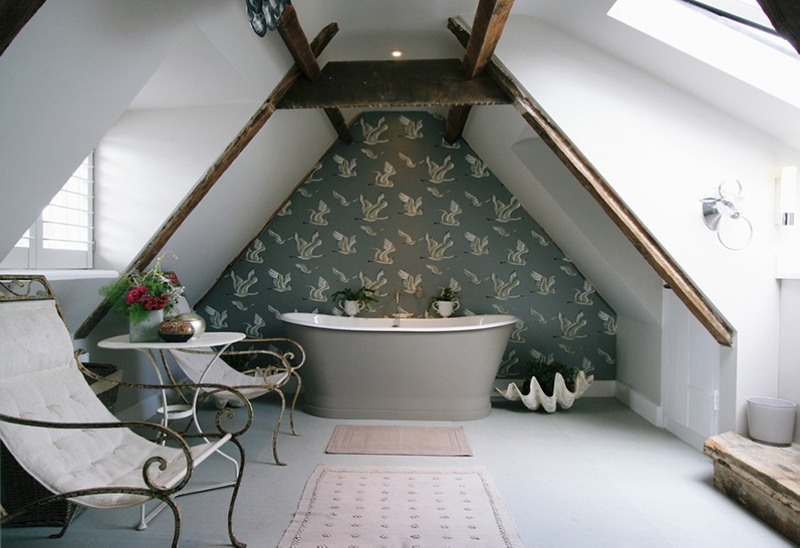 This attic bathroom sure is a beauty! The furniture pieces are interesting, and the overall look is just ravishing! I totally dig spaces like this one because it shows a character you didn’t know that space could actually have. 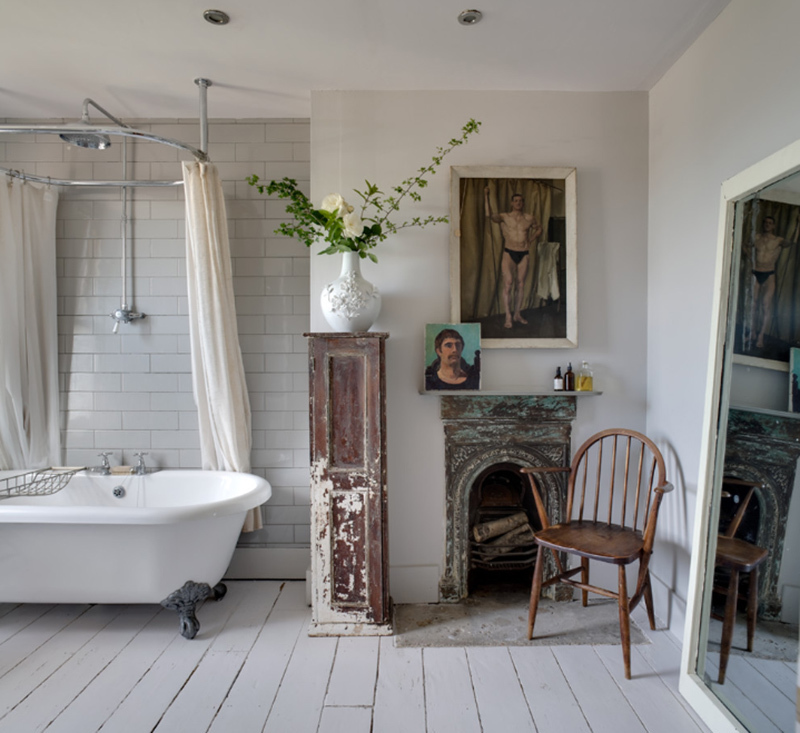 This shabby chic bathroom is totally interesting because of the unique pieces that were added to it – the rectangular cabinet that holds a flower vase, the pictures and paintings, the decorative fireplace, the chair and the large mirror. All interesting things that made this space super wonderful. 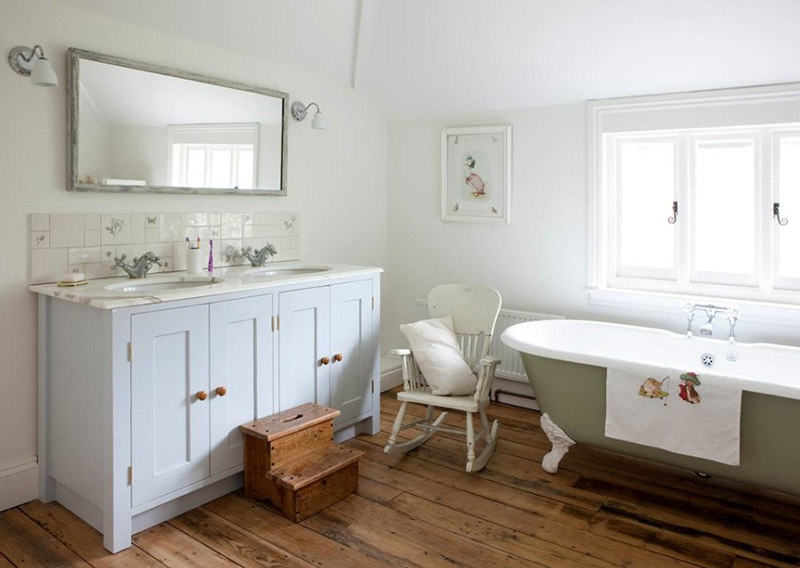 Here is another bathroom photo that shows us that these shabby chic bathrooms usually really have ‘the chair’ that completes its overall look! 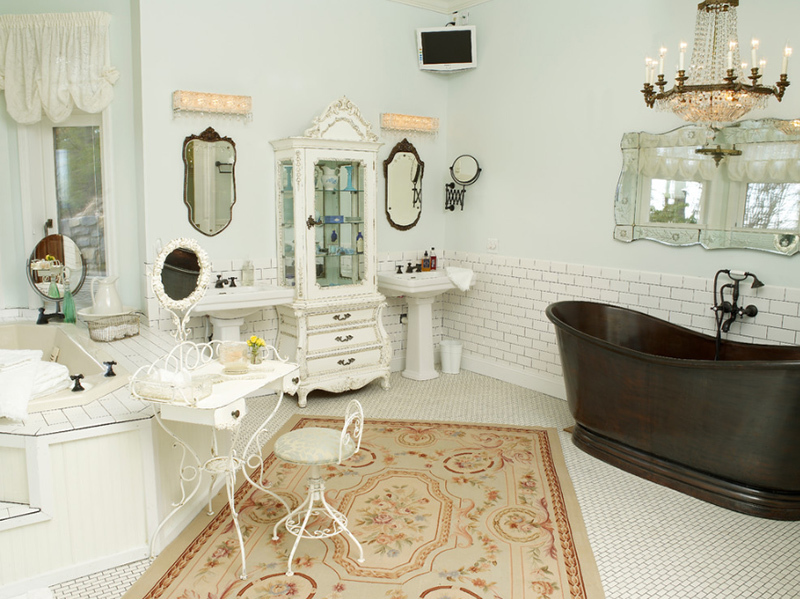 I fancy the vintage tub and the cabinet that holds the double vanity because it totally matches the entire bathroom. 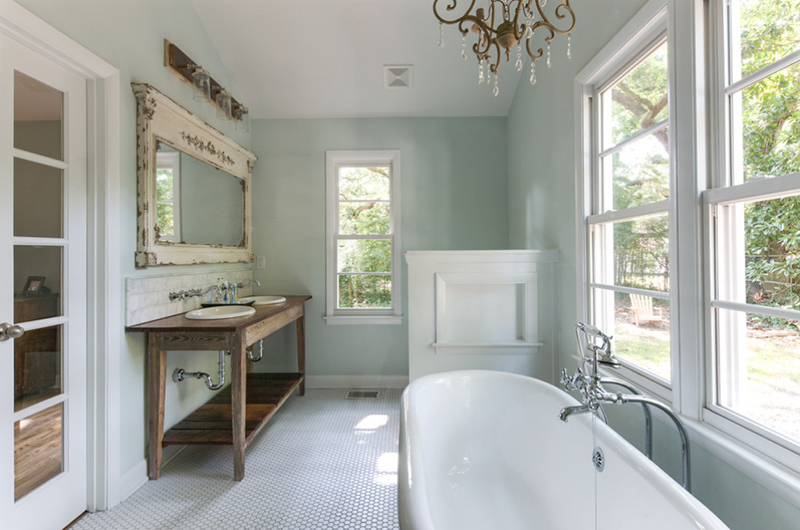 Note that there are a couple of bathrooms in this list that actually has double vanity sinks which is totally fine, but take a look at this one because it looks really great and fancy especially paired with the mirror and the distressed cabinet and modern tub. This bathroom photo is taken from a South Tampa home that boasts a beautiful set of furniture, fixtures and design and definitely quality pieces at that! This bathroom has a couple of items inside it that I think you would actually love. 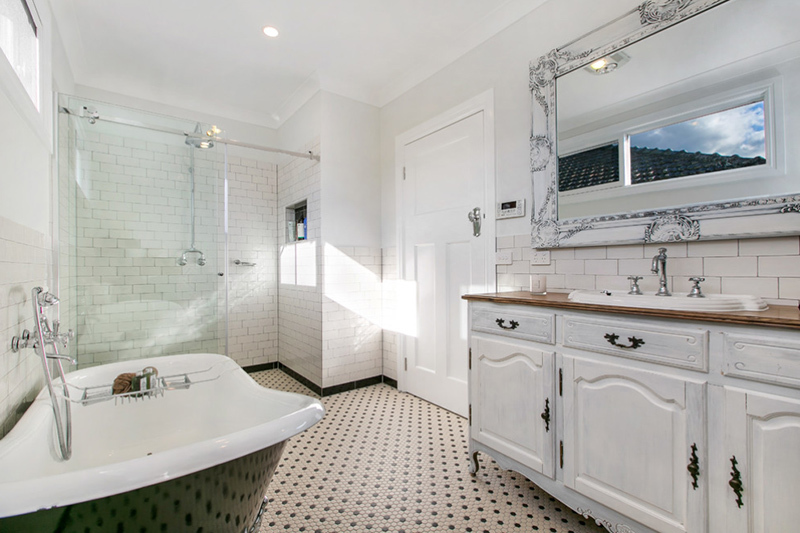 I feel like the cabinet that holds the lavatory in this photo could have been better if it was created into a double lavatory vanity, but then again, this home could belong to a single woman who does not need it, then, the single lavatory is just fine. This Dutch house is located in Sri Lanka. This bathroom sure is a piece of art in itself. 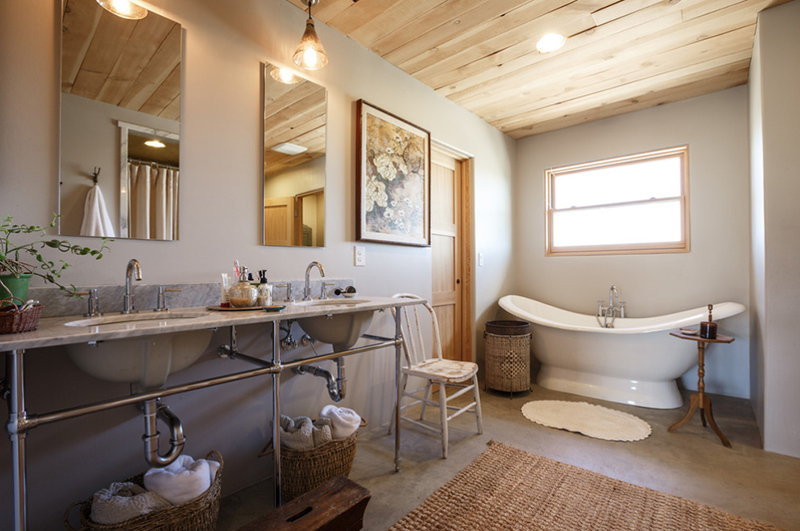 The tub in the center of the room, the heavy-duty furniture around the room sure is nicely placed in their locations that add beauty and interest for the space. 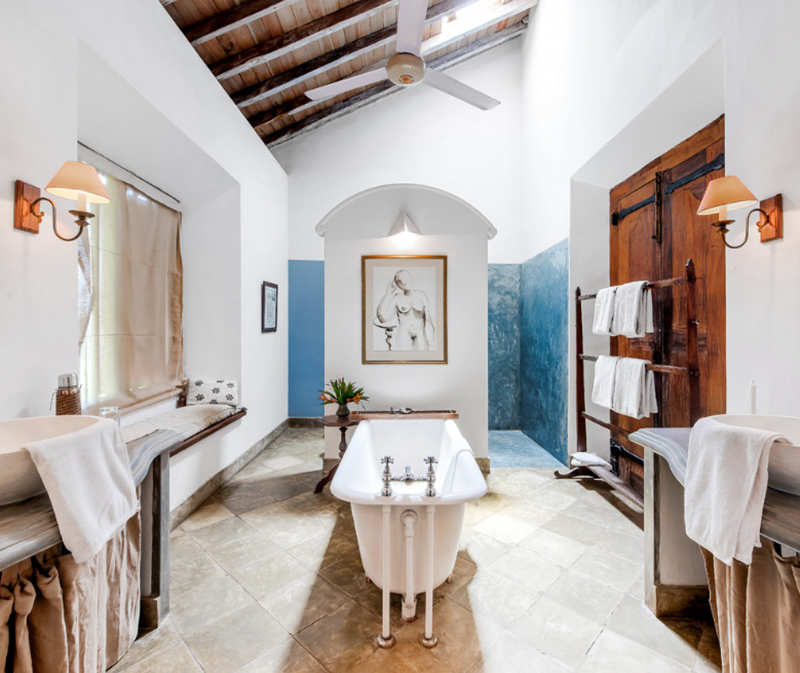 A well-lit bathroom says a lot with the proper design of the space – like a kitchen, bathrooms with tons of lighting or enough window opening sure works well with the killing of the bacteria surrounding it because the bathroom is often wet. In terms of design, this space sure looks stunning as the best wedding cake you’ve seen so far. I am not sure if this bathroom is for kids because of the stools added to each of the lavatories, but I think it totally looks cute and interesting. Mixing and matching different colored furniture or fixtures could really make a space interesting or way boring. 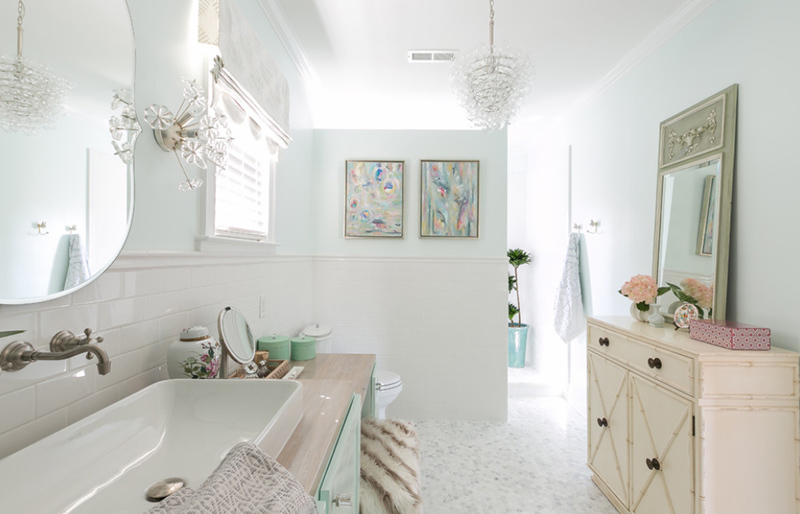 The color of the furniture in this bathroom does not appeal to me as much, but because it contrasts well with the white walls and the tub, it pretty much just worked its magic in making this bathroom look like a real charmer. 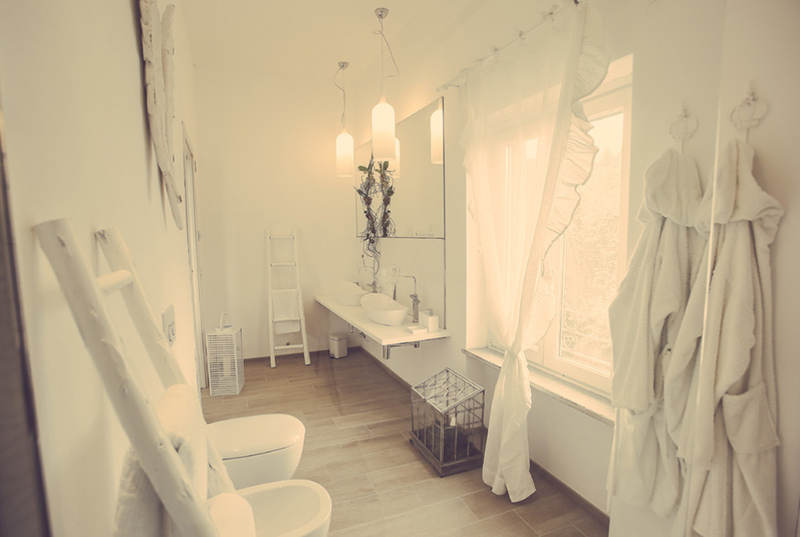 So, have you decided which bathroom design to duplicate if you ever come around to redoing your bathroom? The designs are simple and quite easy to copy if you are into that, but like the shabby chic living rooms, these spaces serve as inspiration or designers or decorators like you and me.